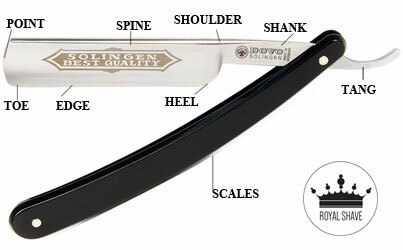 Tag Archives: what is a straight razor? What is Straight Razor Shaving? A straight razor is a razor with a long blade set in a handle and in traditional and current western versions the blade has the ability to fold into the handle. The straight razor is sometimes called an open razor or cut-throat razor. The straight razor was until the early 20th century the most common form of shaving and due to the skill and costs associated with using and owning them, shaving was usually done by a professional barber. It was not uncommon for men from all levels of society to visit the local barber on a weekly basis for a shave and hair cut. The introduction and mass production of an affordable safety razor, most notably by Gillette, in the early 20th century quickly changed this and by the 1950’s the straight razor shave was a dying art. In recent years the straight razor has made a significant comeback as the desire for a more personal and ritualized grooming experience has manifested itself in modern society. Today many barbers proudly offer a straight razor shave and this trend shows no real signs of stopping. The retail consumer has also embraced the straight razor as they have become more affordable in comparison to the mass produced alternatives, particularly over a period of several years of ownership. The straight razor is a time-honed tool, designed to give you an extremely close and accurate shave. There are many straight razors available on the market to choose from based on the steel used, functionality, scale materials, and brand. We will be talking about this more in the weeks to come. If you want to learn the different ways to hold a straight razor go here.